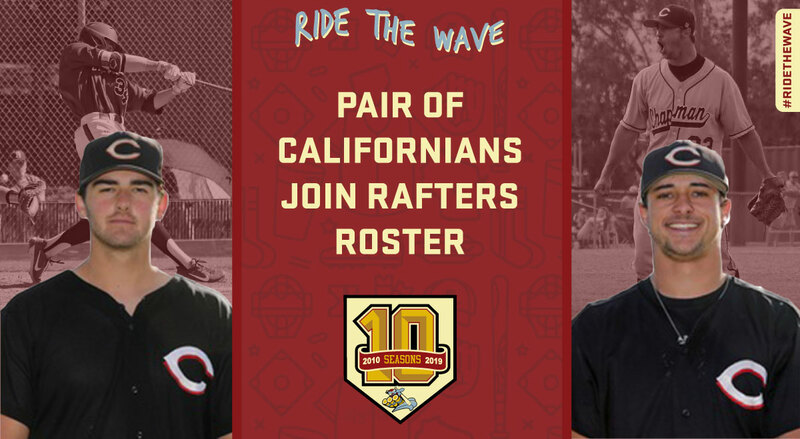 Wisconsin Rapids- Right-handed pitchers Cody Turner and Nick Garcia, both from Chapman University, will be heading to Wisconsin Rapids for the 2019 season, the team announced Thursday. During the 2018 season, Turner’s stellar work out of the bullpen for the Panthers earned him the team Rookie of the Year Award. The 5-11 righty recorded 20.1 innings of work and boasted a 1.77 ERA with a team-high four saves. He finished his freshman season with a 1-0 record in 16 appearances and striking out 27 batters. A Valencia, Californianative, Turner attended Hart High School where he had a 1.93 era in 50.1 innings pitched and earned All-League honors as a senior. “I am so excited to play this summer with the Rafters, as a member of Chapman Baseball I have heard great things about the program ran there in Wisconsin,” said Turner. “After playing in the West Coast League I knew I wanted to take a step up and this seemed like a great fit." Originally from San Carlos, California, Garcia drove in six runs as an infielder at Chapman in his freshman campaign. The 6-3 utility player had 11 hits and a .268 batting average over 24 games. In high school Garcia was selected with post season All-League Honorable Mention at Junipero Serra. Pitching 12.1 innings, Garcia compiled a 2.27 ERA and a 1-1 record his senior year. Off the field, Garcia was named to the All-Academic Team for the SCIAC. This season Garcia will be showing his versatility as he is switching from his role as an infielder to one as a pitcher. Turner and Garcia combined to help Chapman to a 26-14 overall record in 2018. The pair are coming off a successful season as the Panthers won their first Southern California Intercollegiate Athletic Conference Tournament in program history and punched their ticket to the NCAA Division III Tournament, which they ended their run in regionals. The Panthers have high expectations this season as they are the current pick to win the SCIAC. Chapman kicked off their season earlier this week against Hope International. The Rafters open the 2019 season on Friday, May 31, against the Madison Mallards. Want to attend a Rafters game next season? Rafters 9-Game Ticket Packages are on sale now! For more information on all Rafters ticket offerings visit Raftersbaseball.com, call the Rafthouse at 715-424-5400, or come visit us over at historic Witter Field. The Rafthouse is open from 9:00 am to 5:00 pm, Monday through Friday at Witter Field, 521 Lincoln Street in Wisconsin Rapids.